Last week Rodolfo Borrell, Manchester City’s Youth Technical Director ran a training session for Beachside’s U16 Boys team at Goooal Sports Indoor Center in Stratford, Ct. Coach Borell is in the U.S. working with New York City FC’s youth affiliates. Prior to joining Manchester City, Borrell headed Liverpool FC’s Academy (were he trained Raheem Stirling) for five years, and prior to that was a member of FC Barcelona’s Academy staff, where he worked with Lionel Messi and Cesc Fabregas as teenagers. The 90 minute session was observed by Beachside staff, coaches from affiliate clubs South Central Premier and AC Connecticut, and also from the Old Greenwich and Westport Travel programs and the CJSA ODP staff. 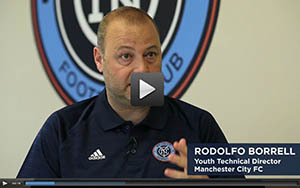 Rodrigo Marion, New York City FC’s Youth Technical Coordinator assisted with the session. Two weeks previoulys our Coaching Director Mickey Kydes had visited Manchester City’s training center in England. “Rodolfo’s hospitality was simply amazing ” says Kydes “He spent four hours with me just talking soccer. From FC Barcelona, Messi, Spanish soccer compared to English soccer, the United States and its potential, Manchester City’s youth program, etc. Then he gave me a tour of Manchester City’s training grounds: just completed 3 months ago and considered the best in the world. We then observed the U9, U10 and U11 training sessions while he was explaining the youth training objectives.